This Gift Voucher is for a 1 hour Reiki treatment. Reiki accelerates the bodies self-healing abilities, creates deep relaxation and aids the body to release stress and tension, It can help with chronic problems, improves sleep and supports the immune system. It works by removing energy block and brings the body into balance. It raises the vibration of the body, increases vitality and provides emotional clearing. 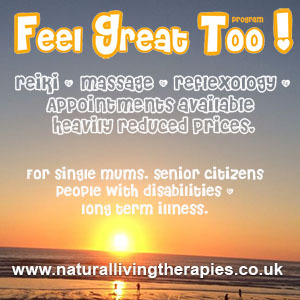 This Gift Voucher is for a 1 hour Reiki treatment and can be redeemed anytime within 3 months from the purchase date. The treatment can be provided either via our mobile service (over 10 miles from St Austell mileage charges apply) or at my in-house treatment room in St Austell.